William V Edwards, 94, of Texas City, passed away Sunday, April 14, 2019, in Texas City, Texas. Born in Frederick, Oklahoma, October 16, 1924, “Bill” spent his early years in Bristow, finally leaving Oklahoma for Galveston as an 18 year old at the suggestion of his older sister who had settled there. He took a job with Todd Dry Docks as a machinist’ helper, then in 1943 he entered the United States Army to serve as a cannoneer for twenty months overseas in the Southwest Pacific and the Philippines. Honorably discharged in 1946, he settled in Galveston, and later, Texas City. He was employed for more than thirty years by Washington National Insurance Company where he received awards for service. Although he never graduated from high school, he earned his GED after retiring and attended College of the Mainland during the 1990-1991 school years, maintaining a 4.0 average and earning a spot on the Dean’s List. He also received a Merit Award from the Mayor of Texas City in 1996 for his commitment to literacy as a volunteer, for many years tutoring in the R.E.A.D. Program and helping incarcerated men and women learn to read and achieve their GEDs for their release. He was preceded in death by his parents, Clyde and Lillian Belle McCall Edwards, and his two sisters, Virginia Varvil and Evelyn Bevil. Also preceding him was his loving wife of 52 years, Barbara. Survivors are his daughters, Lilly Edwards and Barbi Springer, her husband Antony, and grandson Trevor who had a loving relationship with his granddad. He will be missed by many nieces and nephews and a host of friends. A graveside service will be held at 11:00am on Saturday, April 20, 2019 at Hayes Grace Memorial Park Cemetery in Hitchcock, Texas. 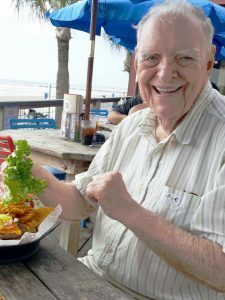 In lieu of flowers donations may be made to Libbie’s Place Senior Day Program by mail to 2803 53rd St, Galveston, TX 77551 or online at www.libbiesplace.org. I will always remember his big Smile every time I was around him! He will be sadly missed BUT he with his lovely bride that he loved so much. God Bless and Prayers for the family! Heaven received another Angel !! Your dad was a ‘fantastic’ man, and he served you and your mom, very well. I know this time is surreal and ever so sad, but he knew you loved him, and he loved you. You will always carry him in your heart, and you’ve been a great daughter to him, as he was a dad to you. What a joy there is in that. I love you. Uncle Bill will be missed. He was also very smart. We always asked him about national sports events and family birth dates. His memory was exceptional. Oh… Barbi.. you’re made of great stuff. What a beautiful thumbnail of his life. I will always remember Bill’s laugh. He always encouraged me back in my Washington National. days. And when I changed my life, he knew it. I am glad I got to know him. We were blessed to know Bill Edwards. He encouraged us in many ways.